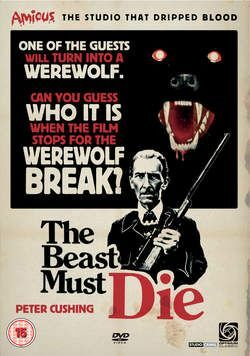 Made in 1974, this British monster movie produced by Hammer-alike outfit Amicus attempted to bridge the transatlantic divide by capitalising on the post-Shaft blaxploitation craze and casting handsome African-American actor Calvin Lockhart in the lead as a big game hunter who gets his kicks by hunting a werewolf. The lycanthrope in question is one of a number of (white) guests - Peter Cushing, Charles Gray and a young Michael Gambon among them - invited to Lockhart’s country estate that’s wired with hi-tech surveillance gear. Based on science fiction author James Blish’s story There Shall Be No Darkness, it’s essentially an Agatha Christie whodunnit with a supernatural twist. As creature features go The Beast Must Die is run-of-the-mill stuff, but it’s enlivened with a great gimmick: at the climax the film freezes for 30 seconds of ‘werewolf time’, whereupon the audience is invited to guess which of the guests is the monster. No extras.